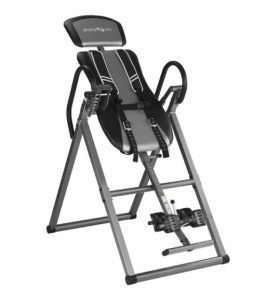 Black and gray Innova Fitness ITX9800 is a late 2016 model inversion table with many comfort, functionality and security features that make it different than other similar units. As a heavy duty inversion unit, it weighs 62 lb., user weight capacity is 300 pounds and measures 55 x 22 x 6 inches. It has a conveniently foldable design and at about 8-inch thickness you can lean it on a convenient wall or under your bed if it fits. With the ankle relief system, you will get no ankle pressure pain and will feel very comfortable on your feet, ankles, and legs. And this is not the case with other inversion tables on the market, simply because your whole body is supported by the two points on ankles. The straps are waiting for patent and they are designed to offer you great comfort on the ankles, feet, and legs. They also bring you extra security as there is no way you will slip or fall off the inversion table. There is the unique side ankle slot pin system that is adjustable to five different positions to accommodate the needs of different users- inversion settings of 15, 30, 45, 60 and 85 degrees. You can invert up to 85 degrees with the pin on this inversion table, but if you choose not to use the pin you will go all the way down to 180 degrees. And it has this protective cover that will both let you position it easier and ensure safer inversion. To adjust the pins, you need to return to your original non-inverted position and move the pin. You have two separate adjustment systems, one for the height and another for the headrest pad through the adjustment pins provided. And the nicely padded backrest is very comfortable. You will invert easily and conveniently with the True Balance System. With all the adjustments available on this unit, anyone at any size or height (users between 4’10” and 6’6” ) will enjoy very smooth inversions to the right center of gravity. Innova Fitness ITX9800 is not only a very comfortable inversion table with a very long and very large backrest support that is thickly padded but also a very sturdy one with the heavy gauge steel tubing and you will feel safe and stable on it. This also means it should last you a long time. The foam handles are rather soft to touch and after you adjust the pin to the angle you want, you will be inverting smoothly and comfortably by holding the handles and putting your arm over your head. You will use the handles again when you want to get back to the original position. The purpose of using an inversion table is elongating the spine and relieving the back pressure on your nerve roots, ligaments and discs, enhancing the blood flow and circulation, getting rid of any stress or muscle pain. But it is always a good idea to consult your health care professional before using any inversion product. The instructions are clear but the pieces are not properly labeled and once you’re done, you can start using it straight away and perhaps have someone near you only for the first time. Warranty included is one year from the manufacturer if you need it for anything within the first 12 months.